It’s that wonderful time of year again! It’s time to start planning your Halloween costume. Time to get creative and come up with something unique and original to either scare, frighten or delight this Halloween. There is nothing better than themed costumes for the whole family. However, coming up with costumes for the entire family can be hard. Most families are busy and don’t have a lot of time or sometimes a lot of money to buy or create costumes. It can be difficult to create elaborate costumes for all the family members but never fear! Here is a list of the simplest group Halloween costumes that will be easy to put together and won’t cost an arm and a leg. The Wizard of Oz is a classic movie that is loved by generations of people. 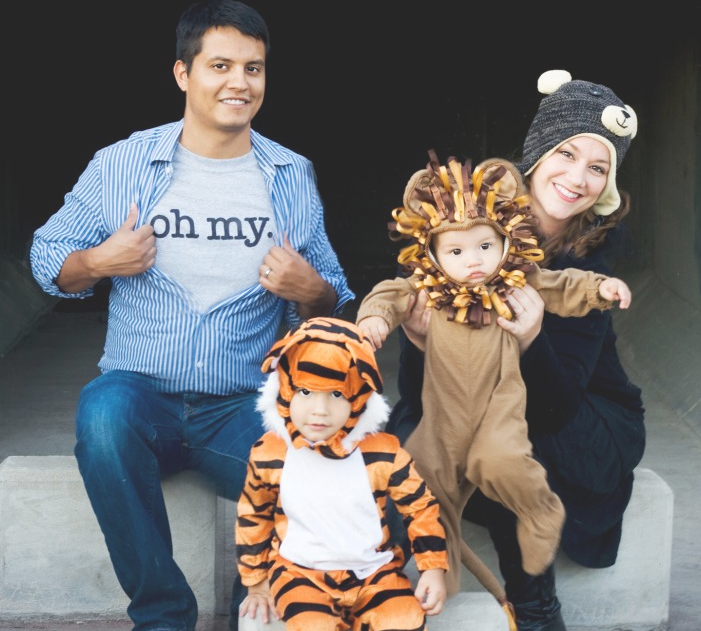 One of the cutest ideas for a family themed Halloween costume is the “Lion, Tigers, and Bears Oh my!” concept. 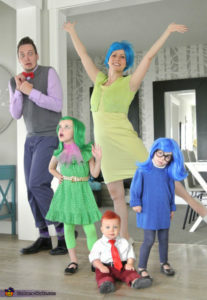 This costume idea is for a family of four. It is an easy and a super recognizable costume idea and there is nothing sweeter than dressing your young ones up as a lion and a tiger. Walmart carries both a lion and a tiger costume for infants. The parents can dress as the bear and the “Oh My!”. The “Oh My!” part of the costume can be as easy as making a shirt with the phrase “Oh My!” printed on the front. The bear part can also be easy by just wearing a hat with bear ears on it. The best part about this costume idea is seeing the children dressed up as cute little animals. Another favorite costume idea that is a combo of cute and frightening is “Shark Attack”. This costume idea is perfect for a family of three or four and requires a child’s shark costume, some board shorts, a surf shirt, a lifeguard shirt, some fake blood and a large piece of cardboard. 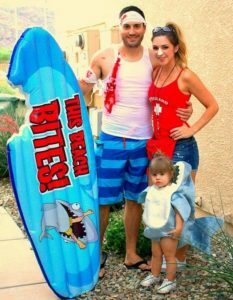 If you have two kids, you can dress them both up as sharks while one parent can be dressed as the shark attack “victim” and the other parent can be dressed as a lifeguard. The Shark Attack Victim costume consists of the board shorts, surf shirt, flip-flops and bandages soaked with fake blood. Wrap the bandages around your head and your arm. Add some fake blood to you face and hair to add an extra touch. The large piece of cardboard is used to create a fake surfboard. This adorable idea is easy and a fun way to celebrate Halloween. Inside Out by Pixar was an adorable family movie that tugged at the heartstrings of both the young and the old. This favorite movie amongst families has highly recognizable characters that make for easy Halloween costumes. For anyone that has seen the movie knows that each character represents an emotion and that emotion is signified by a specific color. The most popular characters in the movie are Joy, Sadness, Disgust, Anger and Fear. Each member of the family can pick their favorite character. For the character of Joy, you will need a blue short haired wig and a green dress. Sadness is easy as well. All you need is a long gray sweater turtleneck, a blue wig, some circular glasses and jeans. Disgust requires a green wig and a green A-line dress with green tights. The character of Anger requires red hair dye, a white shirt, brown suit pants, and a red patterned tie. Fear is a little more complicated. You will need some purple face paint, white face paint, a red bow tie, a blue oxford shirt, blue slacks, a houndstooth vest, and cardboard black curly cue to attach to the top of your head. Use the purple face paint to make your face purple and use the white face paint around your eyes. Make sure to make the white circles around the eyes larger in order to match the character. This fun idea for a family Halloween costume will be sure to amuse friends and family! 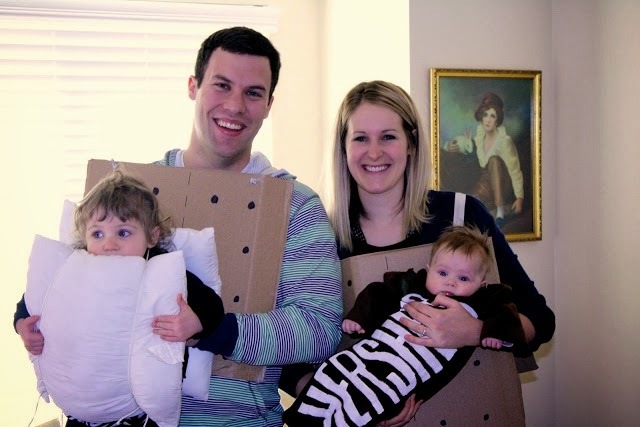 One of the easiest, cheapest and tastiest family costume idea is the S’mores family. These cute costumes require very few items. To make the marshmallow part of the costume, you need two white throw pillows and some white strips of fabric. Sew the white strips of fabric on top of the pillows to create a clapboard. The Hersey’s bar part of the costume consists of a brown long shirt and some white fabric paint. 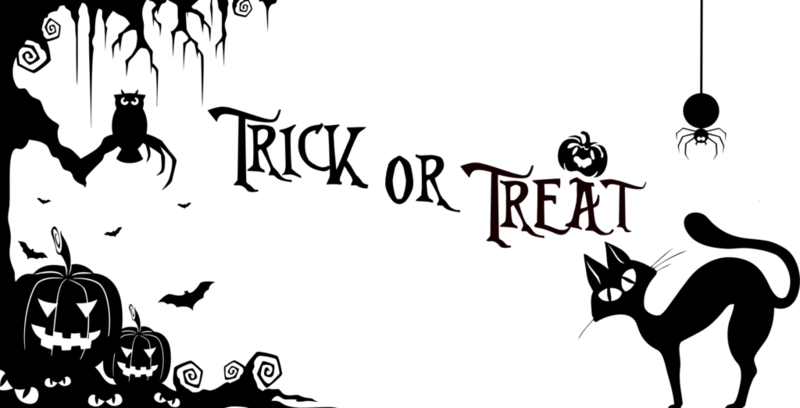 Create your own Hershey’s stencil and use that to paint the word “Hersey” on a brown shirt. The graham cracker part of the costume is the easiest part of the whole getup. Cut out large squares of brown cardboard and use a black marker to mark dashes to create four squares. Use that same marker to mark small circles evenly in each section. One piece of the cardboard is for the front and another piece is for the back. You also create a clapboard with these two pieces by tapping some string between the two pieces. This simple yet effective costume idea is sure to impress others while out celebrating Halloween. 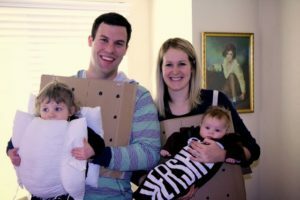 Another creative yet simple family costume idea draws its inspiration from nature. A rainbow and cloud is a fun and colorful way to dress up for Halloween. 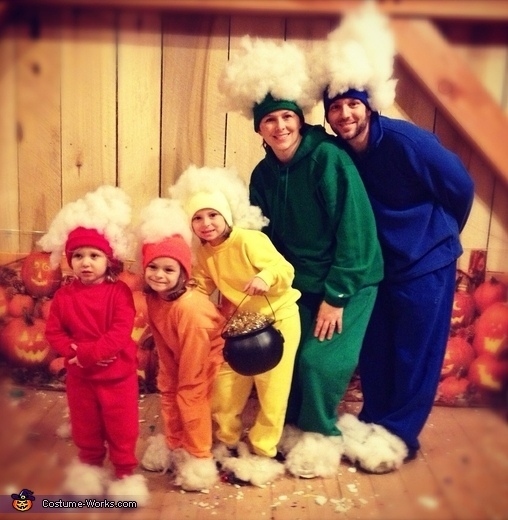 There are many ways to create a rainbow but the easiest and quickest way to create a family rainbow is by dressing each member of the family in one solid color. For example, one member of the family wears red shoes, red sweats, and a red sweatshirt. The next member of the family dons the same outfit but orange this time. Each member of the family wears the exact same outfit but with all the colors of the rainbow. For the cloud portion of the costume, buy solid color beanies that correspond with the color of the rainbow and white cotton balls. Using a hot glue gun, glue the cotton balls in layers on the top of the beanie to create the cloud. This costume idea takes very little effort and is perfect for a cold fall evening. Dressing up as a family is a fun way to celebrate Halloween. It makes for an Instagram worthy photo op and is a great way to bond as a family. Dressing up together doesn’t have to be costly or time consuming. The ideas listed above are easy for anyone to put together and do not cost a lot of money. We would love to hear what the families in Puyallup are doing this year for Halloween. Tweet us your ideas or pictures for your favorite group costume!